Tavolara and nearby islets host populations of Black Rat (Rattus rattus) and House Mouse (Mus musculus). The Black Rat, presumably introduced to the island in Roman times, is now abundant and interferes with many plant and animal species. It is the main threat to the island’s breeding Yelkouan Shearwaters (Puffinus yelkouan), a tubenose whose population on Tavolara (10,000-13,500 pairs) is the largest in the world. Unfortunately, recent monitoring efforts show that only a tiny percentage of the local pairs breeds successfully due to rat predation on eggs and chicks. The eradication of rats from Tavolara will make it possible to protect between 1/3 and 2/3 of the global population of Yelkouan Shearwater, a species undergoing an evident decline. Additionally, by feeding on seeds, invertebrates, and small vertebrates, both Black Rats and House Mice affect the entire island ecosystem and threaten numerous other species. 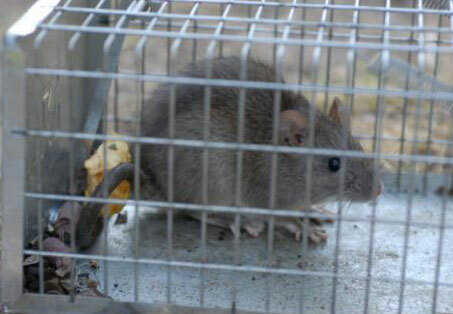 The eradication of Black Rats will take place through the distribution of poisoned bait, using methods that were successfully tested elsewhere in the world (New Zealand, North America, and two Italian islands). All interventions will comply fully with national and regional law, and will follow a protocol agreed upon with a number of leading experts. Several different strategies will be used, and specific measures will be adopted to prevent and reduce any direct or indirect impacts on non-target species. In some areas, the poisoned bait will consist of pellets distributed via air, while in others it will be placed in special dispensers used during rodent control activities. An indispensable part of the plan of activities concerns the monitoring of vertebrate and invertebrate species that may be affected, either positively or negatively, by the implementation of rat eradication. Hottentot figs Carpobrotus sp are present in the part of Tavolara most affected by human activities (Spalmatore di Terra). 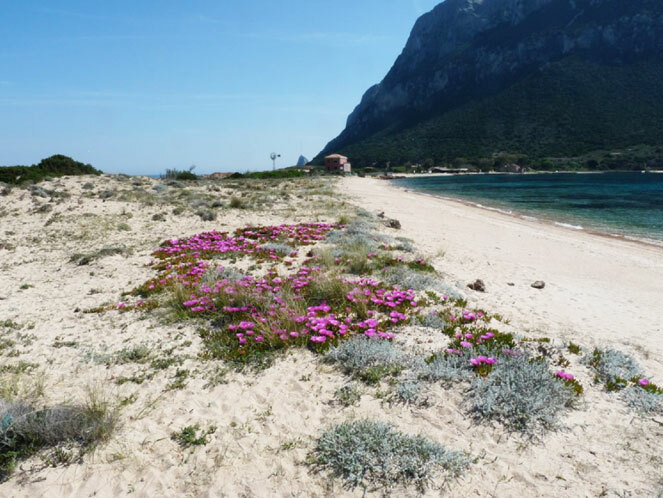 Species in the genus Carpobrotus (C. edulis, C. acinaciformis and hybrids between the two) are native to South Africa, and countless studies have shown them to be among the most invasive alien plants on Mediterranean islands and coastlines. For this reason, they are the target of an increasing number of eradication efforts. It should be noted that where Carpobrotus is present, it quickly becomes the main food for local rats (it accounts for 70 % of their diet on the Hyeres islands), leading to substantial population increases and higher rates of predation on seabirds. By the same token, rats facilitate the expansion of Carpobrotus by transporting their seeds as much as 100 meters away. Eradicating this species from Tavolara early on in its expansion process is both necessary and highly opportune. Preliminary surveys will attempt to ascertain the presence of other alien plants. Should they be deemed potentially harmful, these species, which are currently present with a handful of individuals in very small areas of Tavolara. Save for unforeseen circumstances, the eradication of Carpobrotus will take place exclusively through mechanical means, without the use of chemical products. The introduction of alien ungulates is one of the main threats to fauna and flora on island environment. Recent experiments involving the removal of ungulates have shown how such animals have a negative impact of Centaurea horrida, hindering their regeneration and spread and lowering adult survival rates. The four plant species of Community interest present on Tavolara (Brassica insularis, Rouja polygama, Linaria flava and Centaurea horrida) are all negatively impacted by grazing and trampling. Overgrazing also has negative impacts on habitats of Community interest, and it prevents the re-generation of heavily-grazed tree and shrub species (e.g. Acer monspessulanum) at higher elevations. Eradication is generally thought to be the best management option for island populations of feral goats (except for populations introduced in ancient times and of scientific interest, such as the Montecristo goat). However, on Tavolara it would be best to begin by focusing on population control, in order to assess the effect of a reduced goat population, whose presence could facilitate the long-term survival of several habitats of community interest whose presence is tied to moderate levels of disturbance. The goats will be herded into pens and put up for adoption on the part of interested breeders. A crucial step to ensure that eradication programmes targeting alien species on islands achieve their conservation goals – in this case, first and foremost the protection of the Yelkouan Shearwater – concerns the post-intervention phase, with the implementation of so-called biosecurity measures, which aim to prevent the risk of re-invasion by the species that have been eradicated. On Tavolara, these measures shall include regulations (prohibiting the transport of invasive alien plants onto the island), awareness-raising activities targeting the owners of boats and vessels that land on the island, and a series of stations that will attempt to intercept any rat that may be brought to the island by a boat. 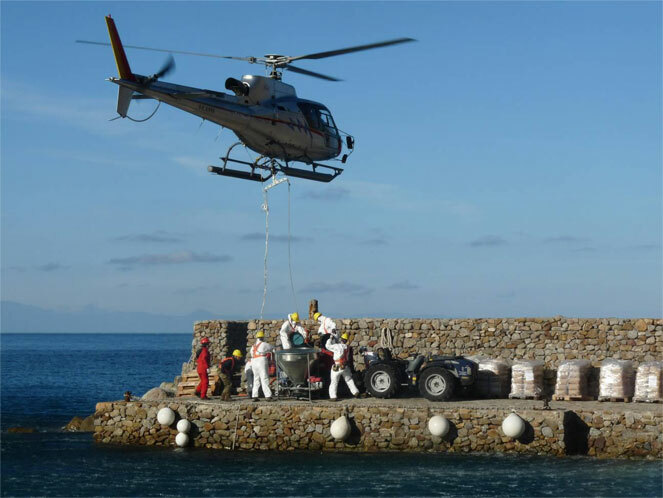 These activities will take place during the final phase of the project, once eradication has been completed. 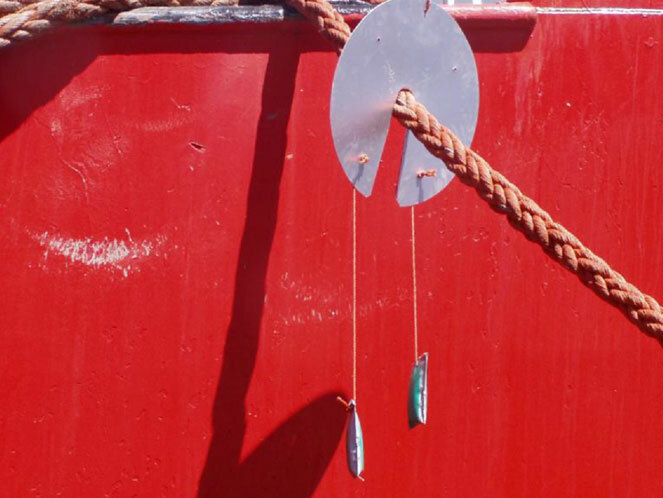 Example of a protection system to prevent rats from disembarking from a boat by climbing down ropes.